By the time they are 18 most people have 32 teeth. The third molars are the last teeth to erupt, at around age 18 to 20. These four teeth are also known as wisdom teeth. If your wisdom teeth are aligned properly and you can reach them to clean them they will probably not have to come out. However, most people have only enough space for 28 teeth in their mouths. Because the wisdom teeth are the last to come through, they often don't have enough space. In this case, they may be crooked, come through only partly, or remain completely embedded within the jaw. These wisdom teeth are called impacted. They may have to be removed to prevent future problems. Your jaw may not be large enough to fit them, and they may become impacted (meaning they can't break through your gums, which is shown in the picture to the right). Your wisdom teeth may break part way through your gums, causing a flap of gum tissue (called operculum) to grow over them. This traps food and germs, causing an extremely painful infection, called pericoronitis. It might also cause an abscess. 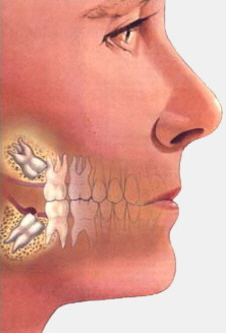 Growing wisdom teeth also put pressure on the surrounding tissues, causing pain and discomfort. More serious problems can happen when impacted wisdom teeth cause a cyst to form, or damage the roots of neighbouring teeth. If this happens, you may lose these teeth. If your wisdom teeth aren't causing problems, it may be difficult to decide whether to have your wisdom teeth removed to prevent possible dental problems later in life. It is rarely harmful to your health to have your wisdom teeth removed, but there are minor risks involved with any surgery. In younger people (late teens and early 20s), the wisdom tooth's roots are not fully developed and the jaw bone is not as dense, so it is easier to take the tooth out than it is later in life. The easier it is to remove the tooth, the easier your recovery is likely to be.